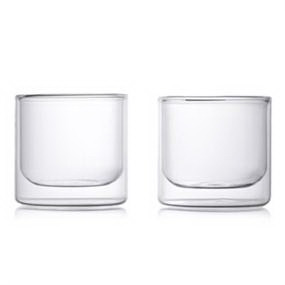 This set of 2 double-wall glasses measuring 3 1/2" tall by 3 1/2" in diameter and holding 9 ounces each. Top quality borosilicate glass construction; durable and heat resistant. Double-wall design creates dramatic optical illusion, prevents condensation, and creates a rounded rim for comfortable drinking. Will keep temperature of liquid hot or cold for a longer period of time while the outer glass remains safe to touch. A design that is practical and visually appealing makes this an exciting product for any home, restaurant or special gift. Dishwasher safe; Microwave safe; Freezer safe; Not recommended for use with metal utensils. All Epare products are backed by the Epare Limited Lifetime Warranty. I'm interested in learning about the Epare Double-Wall Whiskey Glass (Set of 2). Please contact me.